can I turn a gf8 Wrx (turbo) to sti eg ecu ,airflow meter,440cc injectors? DYO Service pacages - is there any interst? Tuning with tactrix and romraider in Welly? 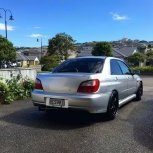 Best Car Spray painters in Wellington. Wash and wax day! i can get prepsol cheap! keen?